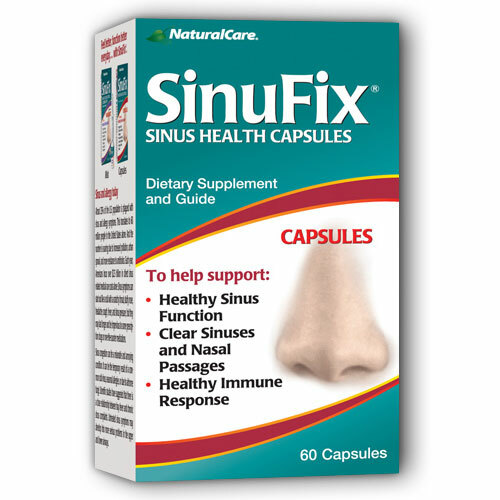 SinuFix supports healthy sinus and nasal passages, promotes healthy immune response, and helps maintain overall well-being. SinuFix (Healthy Sinus Function) contains the highest quality of 100% pure natural ingredients supporting healthy sinus and respiratory functions. Supplement Facts Serving Size 2 Capsules Amount PerServing %DV VitaminA 5,000IU 100% (as Mixed Carotenes from Dunaliella, and vitamin Aacetate) VitaminC 250mg 278% (as Ascorbic Acid) Vitamin B6 30 mg 1500% (as Pyroxide Hcl) Vitamin B5 (as Calciumpantothenate) 100 mg 1000% Zinc (as zinc methionate) 15 mg 100% Bromelain 1600 MCU 250mg Nettle Extract (leaf) (Urtica dioica) 4:1 200 mg Wild Mediterranean Oregano extract 4:1 (leaf) 150 mg GoldenSeal (root) 150mg Quercetin bioflavonoid 125mg N-acetylcysteine (NAC) 100mg Garlic powder (bulb) (odorcontrolled) 100mg N-acetylcysteine (NAC) 100mg Echinacea Extractpurpurea/Angustifolia 50mg (root) 4% phenols Grapefruit Seed Extract 50mg Turmeric Extract 95% curcumin (root) 50 mg Peppermint extract (leaf) 2% essentialoil 100mg Cryptoxanthin (from Dunaliella) 12mcg Zeaxanthin (from Dunaliella) 6mcg Other Ingredients: Gelatin,Purified Water, Glycerin,Titanium Dioxide (Natural mineral capsule color) Suggested Use: As a dietary supplement, adults take 2 SinuFix capsules daily. For optimal benefit, take 2 capsules twice daily during sinus and allergy symptoms. This entry was posted on Tuesday, February 21st, 2006 at 2:09 am and is filed under Allergy Relief. You can follow any responses to this entry through the RSS 2.0 feed. You can leave a response, or trackback from your own site.